1. I suggest you go there in a group then rent a van or a jeepney. 2. If you are from Davao City (like me), start your journey early morning like 5AM. 3. 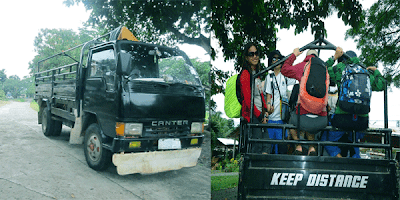 From Davao to North Cotabato City, it will take 4-5 hours of travel if there is no stopping. 4. 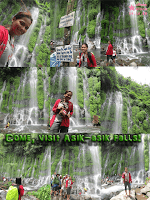 When we reached North Cotabato, we went to the municipality of Alamada. 5. From Alamada, we rented an elf so we can reach Barangay Dado. 6. We have to cross a river via elf so to reach Brgy. Dado. An entrance fee for a cause so they can develop the road will be collected (I can't recall the exact amount) before you can enter Brgy. Dado. 7. 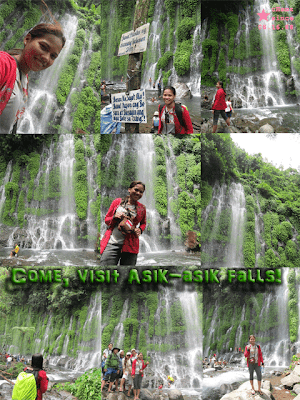 It will take an hour or two before you can reach Sitio Dulao in Upper Dado where the Asik-asik falls is mainly situated. You have to prepare yourself because the road is not yet that developed. It's bumpy and many turns to take. 8. 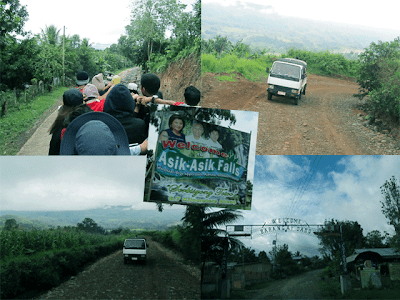 When we reached Sitio Dulalao, we were welcome by the tourism of North Cotabato. We also saw single motorcycles that were parked there which means you can as well rent single motorcycles if you want to reach Sitio Dulalao. 10. It will take 30-45 minutes to go down. Don't forget to stop if you experience short breathes. It's a sweaty journey so always bring water so you don't get dehydrated. 11. After hundreds of steps... Alas, we finally made it! ka gamay pud sa pics uy!